I want to talk about something we all think we know. 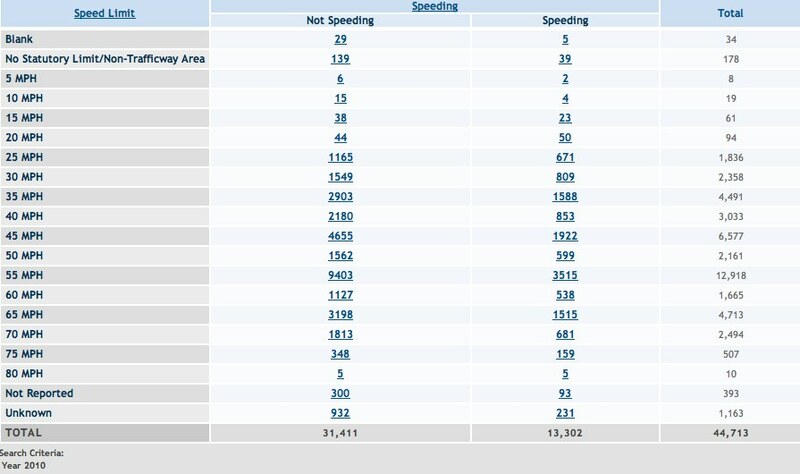 Speed traps, especially the unmanned stationary kind all over my home county in Maryland, are revenue generating, machine perpetuating products of bureaucracy. Unfortunately, bureaucracy is perhaps the most regenerating organism ever invented, so there is no way to ever overcome speed traps by conveying such a rational argument. The only way to actually demolish these outposts of revenue is to declare them as dangerous. I hope to show that they are, in fact, dangerous. First, I’d like to provide some empirical evidence. I’m familiar with two types of stationary unmanned speed trap. There is the set of poles on the side of a county road, usually with a speed limit in the 25-45 mph range, and the portable Jeep (or similar), usually setup along a highway with a construction zone 55 mph limit. What happens when you see one of these? You slow down. Your speed problem has been averted right? What happens behind you when you slow down and the person doesn’t see or know the trap is there? They have a moment of panic at your seemingly erratic driving behavior and slow down faster. In other words, speed traps have the tendency to increase the speed deltas across traffic, especially across multiple lanes of traffic. Some slow down and some do not because of either ignorance or lack of urgency. I don’t know where you live, but where I live the median speed on a 55 mph highway is somewhere around 70 mph. 70 is a reasonable speed, regardless of the speed limit. When people see a speed camera they slow way down, increasing the deltas from average speed. Note also that the study says most crashes related to speed involve speed too fast for the conditions; this is not correlated to speed limits. So crashes occur more often when vehicles have a larger deviation from the average speed, whether slower or faster. Next, let’s take a look at a quite unrelated study on Israeli Daycares. You might have heard about this one before, it was mentioned by the Freakonomics guys as a fascinating commentary on incentives, which it is. The study tracked daycares with a policy to pick up kids by a certain time after school. The daycares that provided a negative incentive for being late - in this case a fine of $3 - actually had an increase in incidence of lateness. This bizarre result shows the power of incentives, even negative incentives, for defining the social contract. The authors provide examples with game theory and show how the addition of the fine changes the equilibrium to allow for a new normal. They also note that “It is true that a ‘large enough’ fee would eventually reduce the behavior.” I know I’d be willing to not worry about being late if it only cost me $3. And I bet we all say the same thing about those speed traps. I’ll slow down usually, but the fine is not scary enough to make me care a lot. $40 is an inconvenience not a dramatic imposition. I wish there was data to show this (I don’t think it’s possible to get it), but I’ll bet the incidence rates of speeding in areas where speed traps have been set have actually increased. The total number of crashes does not seem to be correlated with increasing speed. 55 mph has a big spike because most miles traveled by car are in 55 mph zones on highways. If someone could find me data on the number of highway miles per speed limit designation, I’d love to map it to this to see if they are closely correlated (which I think they are). Speeding occurs in about 1 in 4 fatal crashes. Certainly bad, but not as dramatic as I expected. 20 mph and 80 mph zones are 1 in 2. 70 mph and 75 mph are 1 in 6. Most people travel 5-15 mph above the (sometimes unreasonable) speed limits. 70 mph and 75 mph are probably so low because most people don’t really speed there - they’re going fast enough. Pedestrians have a lower chance (1 in 30 fatalities) to be hit in a construction zone than they do on a normal road (1 in 15 fatalities)! Note, this data isn’t meant to be rigorous or complete, only to show that speeding and construction zones aren’t the big problems speed cameras are trying to fix. So yeah, not so impressed with those stationary speed cameras. Driver education needs to be remarkably better. The average driver, with but 6 hours of “real-world” driving experience at a school can acquire a license with no real concept of how to handle a vehicle. Enforcement of reasonable driving policies needs to be strict. Only passing on the left, staying right except for overtaking, serious penalties for speeding based on real speed limits (I’d be in favor of penalties well over $1000 for driving too fast in a neighborhood), and real and reasonable speed limits are the top items on my list. It’s ridiculous to me that the Autobahns of Germany with large unlimited areas have a fatality rate per miles traveled about one half of the rate in the US. Ironically, as technology gets better, these cameras will shrink to be smaller and more unidentifiable. If they were truly about safety and not revenue, they would remain large and obvious as a deterrent, rather than becoming more and more invisible. Before we can tackle the real problems of road safety, we need to shed the fake bureaucratic solutions like stationary speed traps that only actually make things worse.